Lore is a python framework to make machine learning approachable for Engineers and maintainable for Data Scientists. 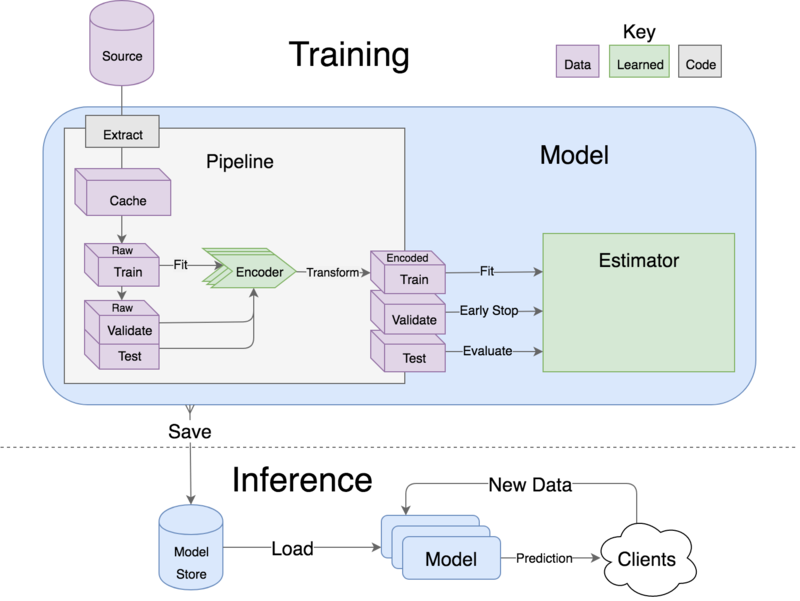 Models support hyper parameter search over estimators with a data pipeline. They will efficiently utilize multiple GPUs (if available) with a couple different strategies, and can be saved and distributed for horizontal scalability. Estimators from multiple packages are supported: Keras (TensorFlow/Theano/CNTK), XGBoost and SciKit Learn. They can all be subclassed with build, fit or predict overridden to completely customize your algorithm and architecture, while still benefiting from everything else. Pipelines avoid information leaks between train and test sets, and one pipeline allows experimentation with many different estimators. A disk based pipeline is available if you exceed your machines available RAM. Transformers standardize advanced feature engineering. For example, convert an American first name to its statistical age or gender using US Census data. Extract the geographic area code from a free form phone number string. Common date, time and string operations are supported efficiently through pandas. Encoders offer robust input to your estimators, and avoid common problems with missing and long tail values. They are well tested to save you from garbage in/garbage out. IO connections are configured and pooled in a standard way across the app for popular (no)sql databases, with transaction management and read write optimizations for bulk data, rather than typical ORM single row operations. Connections share a configurable query cache, in addition to encrypted S3 buckets for distributing models and datasets. Dependency Management for each individual app in development, that can be 100% replicated to production. No manual activation, or magic env vars, or hidden files that break python for everything else. No knowledge required of venv, pyenv, pyvenv, virtualenv, virtualenvwrapper, pipenv, conda. Ain’t nobody got time for that. Tests for your models can be run in your Continuous Integration environment, allowing Continuous Deployment for code and training updates, without increased work for your infrastructure team. Workflow Support whether you prefer the command line, a python console, jupyter notebook, or IDE. Every environment gets readable logging and timing statements configured for both production and development. This example demonstrates nested transformers and how to use lore.io with a postgres database users table that has feature first_name and response has_subscription columns. If you don't want to create the database, you can follow a database free example app on medium. We'll naively try to predict whether users are subscribers, given their first name. Pipelines are the unsexy, but essential component of most machine learning applications. They transform raw data into encoded training (and prediction) data for a model. Lore has several features to make data munging more palatable. # that reference sql columns in the extract by name. # your list with features for your model. Define some models that will fit and predict the data. Base models are designed to be extended and overridden, but work with defaults out of the box. self.assertEqual(list(predictions), list(model.pipeline.encoded_test_data.y))  # hah hah hah! ├── README.md                <- The top-level README for developers using this project. Lore provides python modules to standardize Machine Learning techniques across multiple libraries. lore.models are compatibility wrappers for your favorite library — Keras, XGBoost, SciKit Learn. They come with reasonable defaults for rough draft training out of the box. lore.pipelines fetch, encode, and split data into training/test sets for models. A single pipeline will have one Encoder per feature in the model. lore.encoders operate within Pipelines to transform a single feature into an optimal representation for learning. lore.stores save intermediate data, for reproducibility and efficiency. Use your favorite library in a lore project, just like you'd use them in any other python project. They'll play nicely together. There are many ways to manage python dependencies in development and production, and each has it's own pitfalls. Lore codifies a solution that “just works” with lore install, which exactly replicates what will be run in production. Lore projects use the system service manager (upstart on ubuntu) instead of supervisord which requires python 2. Lore supports runtime.txt to install and use a consistent version of python 2 or 3 in both development and production. Lore supports reading environment variables from .env, for easy per project configuration. We recommend .gitignore .env and checking in a .env.template for developer reference to prevent leaking secrets.